CL image of a sheared quartz-muscovite gouge. Credit: André Niemeijer. 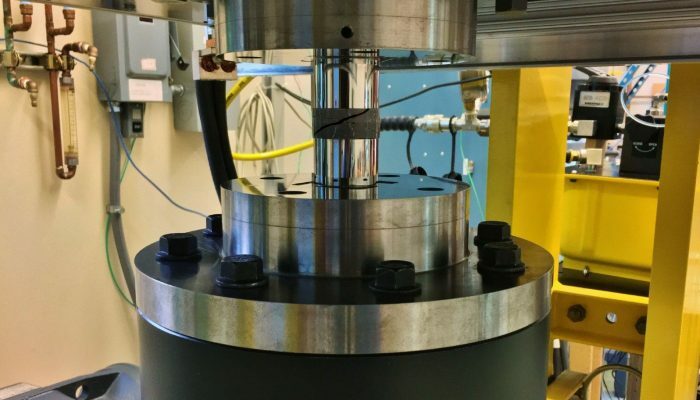 In this blogpost we will go on a tour of the High Pressure and Temperature (HPT) Laboratory at Utrecht University and learn about some of the interesting science done there. 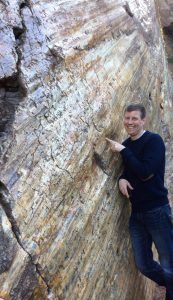 André Niemeijer next to a striated fault surface. Credit: André Niemeijer. André’s main interest is fault friction and all the various processes that are involved in the seismic cycle. This includes the evolution of fault strength over long and short timescales, the evolution of fault permeability and the effects of fluids. His current research is aimed at understanding earthquake nucleation and propagation by obtaining a better understanding of the microphysical processes that control friction of fault rocks under in-situ conditions of pressure, temperature and fluid pressure. Most of the deformation in the Earth’s brittle crust occurs on and along faults. Fault movement produces fine-grained wear material or gouge, which is very prone to fluid-rock interactions and mineral reactions (Wintsch, 1995). It has long been recognized that the presence of a fluid allows for deformation to occur at much lower differential stresses than without. One of the mechanisms by which this deformation occurs is pressure solution (alternatively termed “solution-transfer creep” or “dissolution-precipitation creep”). 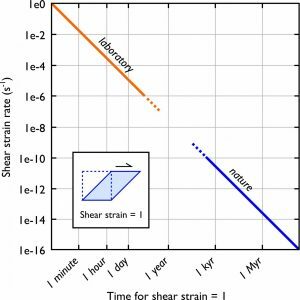 This mechanism operates through the dissolution of materials at sites of elevated stress, diffusion along grain boundaries and re-precipitation at low stress sites (e.g. pores). Pressure solution is an important diagenetic process in sandstones and carbonates as evidenced by the presence of stylolites in many carbonate rocks, which are often used as counter tops and floors (particularly in banks, I noticed). In addition, it has been suggested that pressure solution plays an important role in the accommodation of (slow) shear deformation of faults (Rutter & Mainprice, 1979) and possibly in controlling the recurrence interval of earthquakes (Angevine, 1982). Experimentally, it is challenging to activate pressure solution or mineral reactions in the laboratory, because they are typically slow processes. Moreover, it is difficult to find evidence of their operation. We have used a unique hydrothermal rotary shear apparatus, which is capable of temperatures up to 700 °C to activate pressure solution in fine-grained quartz gouges. We were able to prove that new material was precipitated by using a combination of state-of-art electron microscopy techniques that involve cathodoluminescence (CL). The hydrothermal rotary shear apparatus at the HPT laboratory at Utrecht University, the Netherlands. Credit: André Niemeijer. The CL signal of a mineral depends on the type and level of impurities and defects that are present. We used quartz derived from a single crystal which showed relatively uniform CL. Because our apparatus has various metal alloy parts, small amounts of aluminium are present in the fluid. Aluminium can be incorporated in newly precipitated quartz, which gives a different CL signal. This allows us to map the locations where quartz has newly formed and link this to the experimental data. Taken together, we can use these to derive and constrain microphysical models for fault slip that can be used to extrapolate to natural conditions (e.g. Chen & Spiers 2016, van den Ende et al., 2018). RGB overlay of secondary electron and cathodoluminescence signals in a deformed quartz sample. Newly precipitated quartz shows up in a blue colour. Credit: Maartje Hamers. Outcrops of natural faults often show evidence for enhanced mineral reactions with increasing shear strain. For instance, the Zuccale fault (Isle of Elba, Italy) has a high content of talc in the highest strained portion of the fault (Collettini & Holdsworth, 2004). Talc is a frictionally weak mineral and its presence in the Zuccale fault provides an explanation for the possibility of slip along this low-angle normal fault. We were able to produce talc experimentally from mixtures of dolomite and quartz in only 3-5 days of shearing at low velocity. 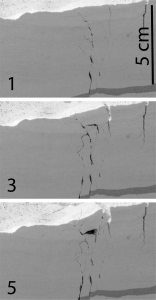 This shearing was accompanied by major weakening, with friction dropping from 0.8 to as low as 0.3. The reaction to talc is sensitive to temperature and fluid composition. At slightly higher temperature, we produced diopside and forsterite which are frictionally unstable and generated audible laboratory earthquakes. We tried a whole range of different analytical techniques to identify the reaction products. Despite the obvious frictional weakening that we observed, talc was only observed in two samples with x-ray diffraction (XRD). Fourier-transform Infrared analysis, on the other hand, proved to be very sensitive to talc and has the big advantage that only a small amount of material is needed (~70 mg). Electron microscopy with EDS-analysis (Energy Dispersive X-ray Spectroscopy) proved helpful to some extent, because it shows the phase distribution. However, the small size of reaction products gives a mixed chemistry, which complicates the identification of reaction products. Finally, to positively identify the various phases in the different samples, we employed Raman mapping. 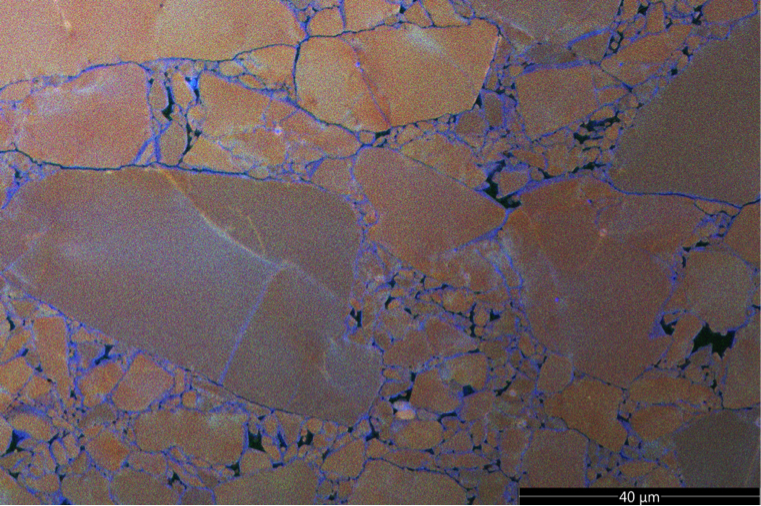 RGB overlays of EDS analyses of samples deformed at 300 °C (left) and 500 °C (right). Dolomite appears in yellow, quartz in blue, calcite in red, talc in cyan in the left image, while dolomite is orange, calcite is red, diopside is purple and forsterite is cyan in the right image. Credit: André Niemeijer. 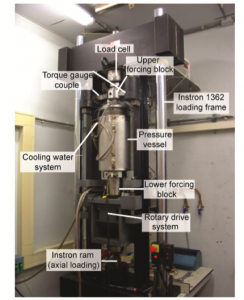 Our studies have shown that reactions can be quite rapid in fine-grained fault gouges. 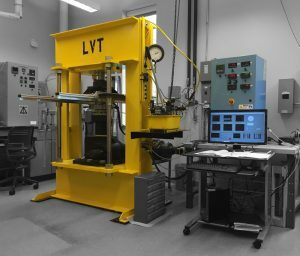 These reactions can have a profound effect on both fault strength and stability but are typically ignored in large-scale models of the seismic cycle. Incorporating reactions requires models that can account for the effect of stress and grain size reduction on the development of faults, which is not an easy task, but is a necessary ingredient to understand the long-term behavior of faults. Angevine, C. L., Turcotte DL, Furnish MD. (1982) Pressure solution lithification as a mechanism for the stick-slip behavior of faults. Tectonics 1 (2), 151-160 doi:10.1029/TC001i002p00151. Chen, J. and Spiers CJ. (2016) Rate and state frictional and healing behavior of carbonate fault gouge explained using microphysical model. Journal of Geophysical Research: Solid Earth 121 (12), 8642-8665 doi:10.1002/2016JB013470. Collettini, C. and Holdsworth RE. (2004) Fault zone weakening and character of slip along low-angle normal faults: Insights from the Zuccale fault, Elba, Italy. Journal of the Geological Society 161 (6), 1039-1051 doi:10.1144/0016-764903-179. E H Rutter, D H Mainprice (1979)On the possibility of slow fault slip controlled by a diffusive mass transfer process. Gerlands Beitr. Geophysik, Leipzig 88 (1979) 2, S. 154-162.
van den Ende, M. P. A., Chen J, Ampuero J., Niemeijer AR. (2018) A comparison between rate-and-state friction and microphysical models, based on numerical simulations of fault slip. Tectonophysics 733, 273-295 doi:10.1016/j.tecto.2017.11.040. Wintsch, R. P., Christoffersen R, Kronenberg AK. (1995) Fluid-rock reaction weakening of fault zones. Journal of Geophysical Research: Solid Earth 100 (B7), 13021-13032 doi:10.1029/94JB02622. A lonely road in Wadi Al Hoqain, Oman. To the right: a date palm farm. To the left: mantle peridotite. The mantle section in the Haylayn massif can be as much as 15 kilometres thick. Credit: Christopher Spencer. 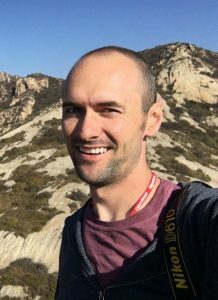 For this first Minds over Methods of 2019, we invited Christopher Spencer, Senior Research Fellow at Curtin University in Australia, to tell us something about tectonochemistry. By applying geochemistry to tectonic processes, it is possible to get more insight into the different stages of the rock cycle. 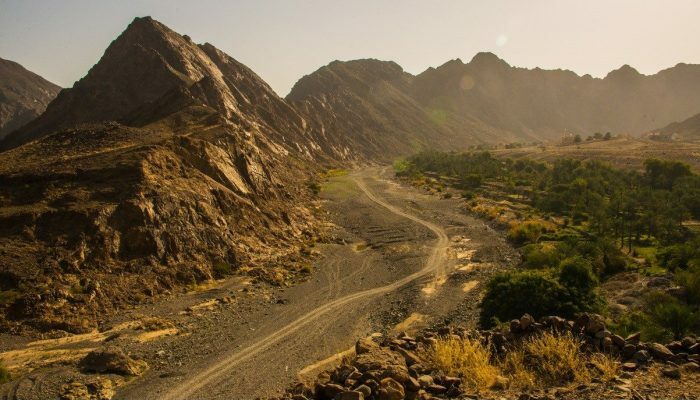 By combining fieldwork and geochemical analyses of the Oman/UAE ophiolite, Chris and his co-workers believe they found the first direct and in-situ evidence of sediment melting in the mantle. The rock cycle is the first thing we learn in Geology 101. Magma and lava cool to form igneous rocks. Igneous rocks then erode to form sediment, which forms sedimentary rocks as it is compacted. Increasing pressure and heat then create metamorphic rocks, which eventually will melt. In each of the transitions described in the rock cycle, tectonics is usually involved. Granite batholiths form in subduction zones and are uplifted and eroded in collision zones. The sediments derived therefrom are deposited along continental margins that are often then returned to subduction zones where they contribute to new magmatic systems. 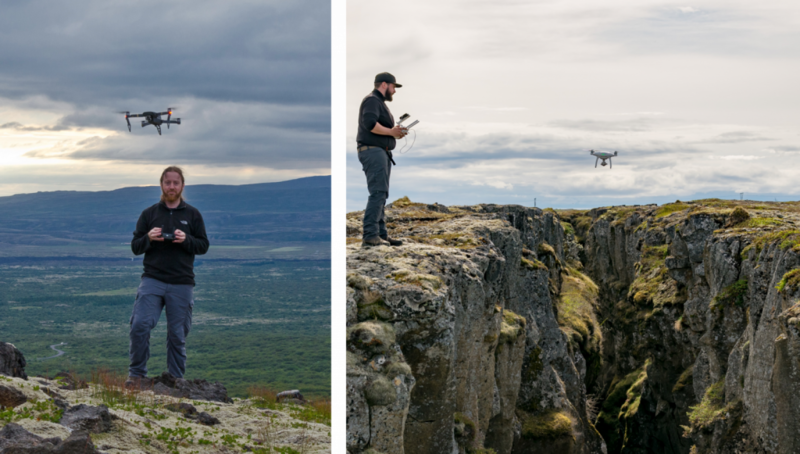 There is a wide array of tools that we can use to evaluate the role of tectonics in the rock cycle, of which geochemistry is able to provide insight into each stage of the process. 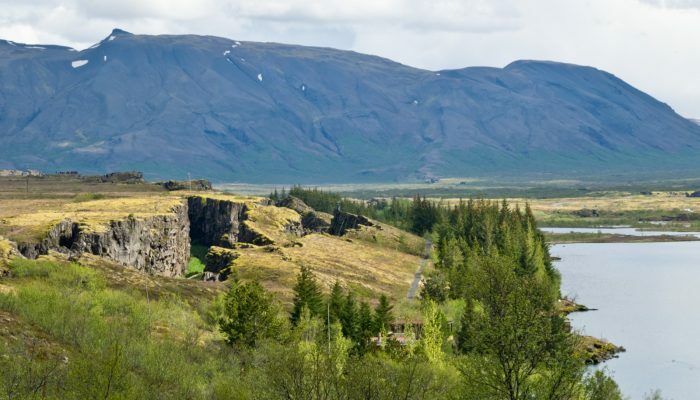 Applying geochemistry to tectonics is (unsurprisingly) referred to as tectonochemistry. Similar to tectonophysics, where geophysics is applied to address large-scale tectonic questions, tectonochemistry provides a unique view into geochemical proxies of tectonic processes. The melting of sediment along convergent margins is a classic tectonochemical problem, as the unique chemical signature of sediment found in a granite provides unequivocal evidence for the melting of a sedimentary rock. In collisional systems, like the Himalaya, tectonochemistry has been used to constrain the melting of meta-sedimentary rocks as crustal thickening and decompression drives dehydration of micas which leads to melting. Collisional systems provide clear and in situ evidence for sediment melting. 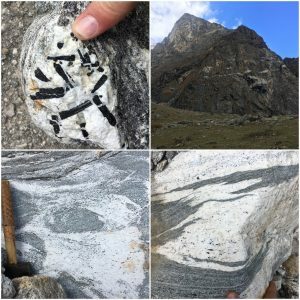 Figure 1: Clockwise from top left: tourmaline-bearing leucogranite from the Himalaya in NW India, leucogranite dykes intruding meta-sedimentary rocks exposed at 5000m altitude, in situ melting of meta-pelite and formation of leucogranite, incongruent melting of muscovite + plagioclase + quartz to form leucogranite but leaving the biotite behind. Credit: Christopher Spencer. 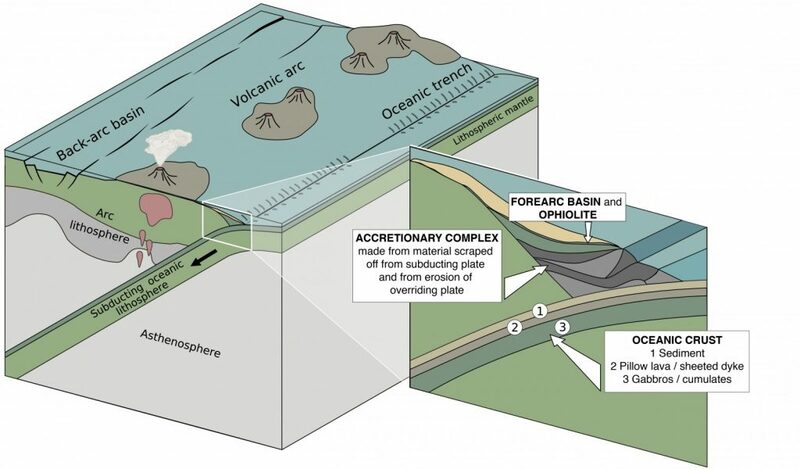 Sediments are also thought to melt in subduction systems, but given the difficulty of accessing the asthenosphere directly, it is more challenging to constrain the processes occurring deep in a subduction zone. The incorporation of sediment in subduction zones is often constrained using the geochemistry of the resulting magmatic rocks. The chemical signature of sediment provides a clear indication of its incorporation in the magma, but it is often unclear whether the contamination is occurring in the asthenospheric wedge or in the upper crust. For example, many granite batholiths contain zircon grains that are foreign to the host magma and whose age spectra match the detrital zircon age spectra of the adjacent sedimentary units. This relationship is a clear indication that sedimentary contamination occurred in the upper crust. Unfortunately, the geochemical proxies used to establish the sedimentary contamination only provide indirect evidence for the subduction of sedimentary material into the asthenospheric wedge. Such indirect evidence includes seismic stratigraphy showing sedimentary units being subducted beneath the forearc and whiffs of sedimentary geochemical signals in arc volcanics. Although these evidences point towards sediment being subducted deep into the asthenospheric wedge where it melts and contaminates the magmas coming off the subducting slab, they do not preserve direct evidence of sediment melting in the mantle. To acquire direct evidence of processes happening deep in the mantle, I set my sights on the Oman/UAE ophiolite, where a thick succession of mantle peridotite is preserved beneath a complete stratigraphic section of oceanic crust. Previous work has shown that this ophiolite not only preserves an intact record of oceanic crustal stratigraphy, but also geochemical features of a subduction zone in the oceanic crust. This implies the ophiolite formed in a supra-subduction setting, where during the earliest phase of subduction, extension in the upper plate caused rifting and formation of oceanic crust above a subduction zone. 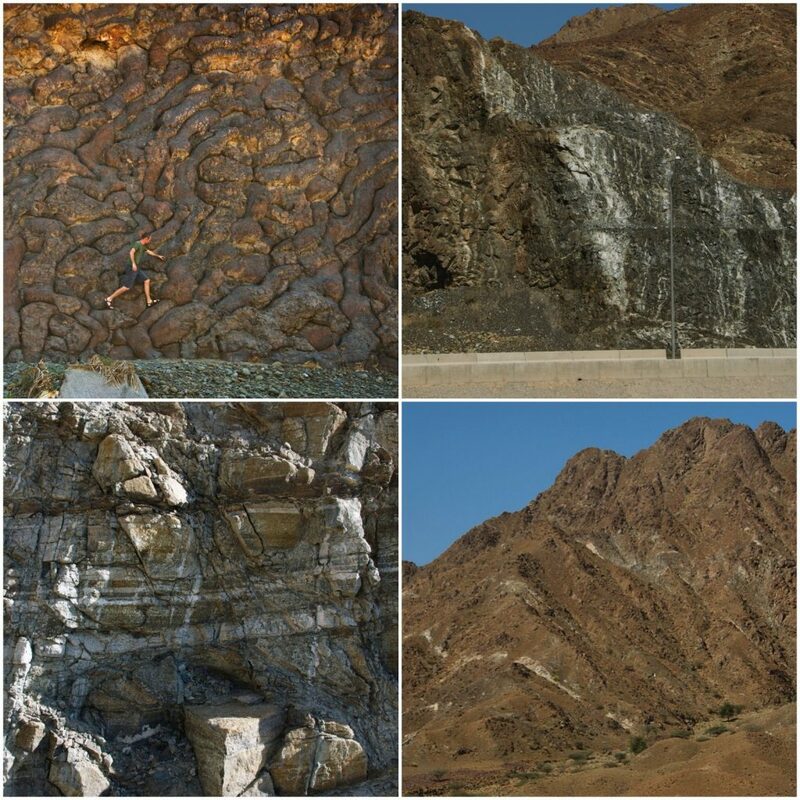 Figure 2: Oceanic crustal stratigraphy of the Oman/UAE ophiolite comprised of (clockwise from top left): pillow basalts, sheeted dykes, layered gabbros, and mantle peridotite. Credit: Christopher Spencer. During fieldwork in the ophiolite, while traversing the 8-15 km thickness of the mantle peridotite, I encountered a number of granitoid dykes that cross cut the peridotite, but do not cross the petrologic Moho. Many of these dykes contained tourmaline, muscovite, biotite, and even andalusite, minerals that would be expected from the melting of sedimentary material. Finding these minerals in the mantle indicates these grantoid dykes formed from the melting of sedimentary material and here they were within the mantle! Subsequent analysis of zircon grains from these granitoid dykes revealed the age of these dykes was equivalent to the age of the overlying ophiolite providing bullet-proof evidence that they intruded while the ophiolite was forming above a subduction zone. To provide the nail in the coffin for a sedimentary origin, I performed oxygen isotope analysis of the zircon and quartz. Sedimentary material has a distinct oxygen isotopic composition and igneous rocks that are thought to have experienced sediment contamination have δ18O values that lie along mixing lines between a sediment end member and the mantle. The oxygen isotopic analyses of the sub-Moho granitoids of the Oman/UAE ophiolite revealed the highest δ18O values ever measured in igneous rocks, providing unequivocal evidence that these granitoids represent pure sediment melts. In a paper published in Geology (Spencer et al., 2017), my coauthors and I argue these igneous rocks represent the first direct and in situ evidence of sediment melting in the mantle. Lucky for us, we have just scratched the surface of the exciting things left to learn about these fascinating granitoids and I look forward to the opportunity to return to the Oman/UAE ophiolite. 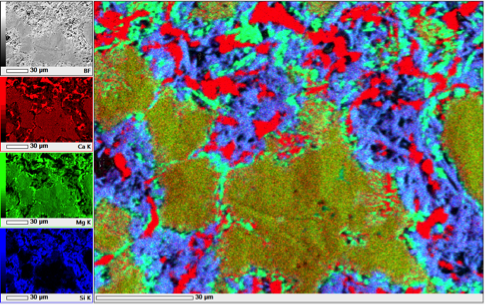 Figure 3: Sub-Moho granitoids of the Oman/UAE ophiolite: A) Cathodoluminescence image of a zircon shown with location and result of δ18O analyses. B) Photograph of sub-Moho granitoids. C) Hand sample of granite with tourmaline and lepidolite (lithium-bearing mica). Credit: Christopher Spencer. In this edition of Minds over Methods, Aurore Sibrant, postdoc at Bretagne Occidentale University (France) explains how she studies the shape of oceanic ridges, and which parameters are thought to control this shape. By using laboratory experiments combined with observations from nature, she gives new insights into how spreading rates and lithosphere thickness influence the development of oceanic ridges. Mid-oceanic ridges with a total length > 70 000 km, are the locus of the most active and voluminous magmatic activity on Earth. This magmatism directly results from the passive upwelling of the mantle and decompression melting as plates separate along the ridge axis. Plate separation is taken up primarily by magmatic accretion (formation of the oceanic crust), but also by tectonic extension of the lithosphere near the mid-ocean ridge, which modifies the structure of the crust and morphology of the seafloor (Buck et al., 2005). 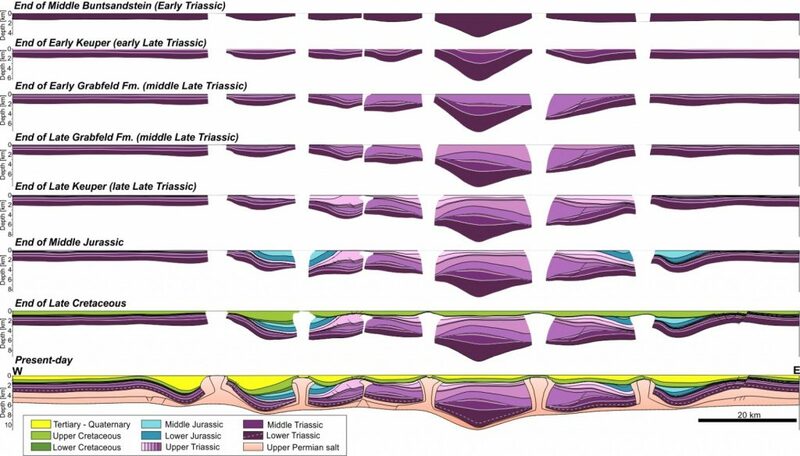 Therefore, the morphology of the ridge is not continuous but dissected by a series of large transform faults (> 100 km) as well as smaller transform faults, overlapping spreading centres and non-transform offsets (Fig. 1). Altogether, those discontinuities form the global shape of mid-ocean ridges. While we understand many of the basic principles that govern ridges, we still lack a general framework for the governing parameters that control segmentation across all spreading rates and induce the global shape of ridges. Geophysical (Schouten et al., 1985; Phipps Morgan and Chen, 1993; Carbotte and Macdonald, 1994) and model observations (Oldenburg and Brune, 1975, Dauteuil et al., 2002, Püthe and Gerya, 2014) suggest that segmentation of oceanic ridges reflects the effect of spreading rate on the mechanical properties and thermal structure of the lithosphere and on the melt supply to the ridge axis. 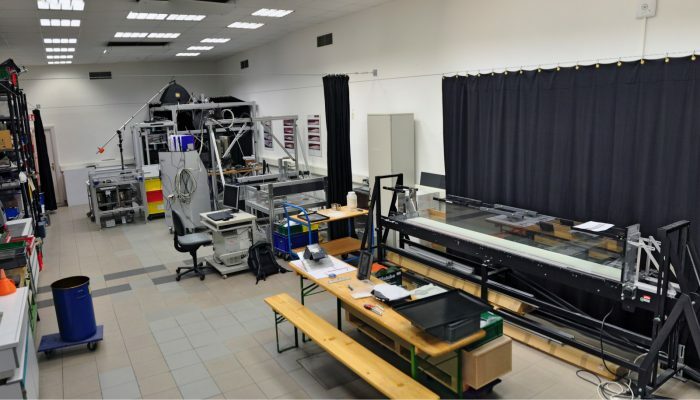 To understand the conditions that control the large-scale shape of mid-ocean ridges, we perform laboratory experiments. By applying analogue results to observations made on Earth, we obtain new insight into the role of spreading velocity and the mechanical structure of the lithosphere on the shape of oceanic ridges. The analogue experiment is a lab-scale, simplified reproduction of mid-oceanic ridges system. Our set-up yields a tank filled from bottom to top by a viscous fluid (analogous to the asthenosphere) overlain by the experimental “lithosphere” that can adopt various rheologies and a thin surface layer of salted water. This analogue lithosphere is obtained using a suspension of silica nanoparticles which in contact with the salted water emplaced on the surface of the fluid causes formation of a skin or “plate” that grows by diffusion. This process is analogous to the formation of the oceanic lithosphere by cooling (Turcotte and Schubert, 1982). With increasing salinity, the rheology of the skin evolves from viscous to elastic and brittle behaviour (Di Giuseppe et al., 2012; Sibrant and Pauchard, 2016). The plate is attached to two Plexiglas plates moving perpendicularly apart at a constant velocity. The applied extension nucleates fractures, which rapidly propagate and form a spreading axis. Underlying, less dense, fresh fluid responds by rising along the spreading axis, forming a new skin when it comes into contact with the saline solution. By separately changing the surface water salinity and the velocity of the plate separation, we independently examine the role of spreading velocity and axial lithosphere thickness on the evolution of the experimental ridges. Figure 2. Close up observations of analogue mid-oceanic ridges and schematic interpretation for different spreading velocity. The grey region is a laser profile projected on the surface of the lithosphere: the laser remains straight as long as the surface is flat. Here, the large deviation from the left to centre of the image reveals the valley morphology of the axis. Credit: Aurore Sibrant. Over a large range of spreading rates and salinities (Sibrant et al., 2018), the morphology of the axis is different in shape. The ridge begins with a straight axis (initial condition). Then during the experiment, mechanical instabilities such as non-transform offset, overlapping spreading centres and transform faults develop (Fig. 2) and cause the spreading axis to have a non-linear geometry (Fig. 3). A key observation is the variation of the shape of the analogue ridges with the spreading rate and salinities. For similar salinity and relative slow spreading rates, each segment is offset by transform faults shaping a large tortuous ridge (i.e. non-linear geometry). In contrast, at a faster spreading rate, the ridge axis is still offset by mechanical instabilities but remains approximately linear. Figure 3. Ridge axis morphology observed in the experiments and schematic structural interpretations of the ridge axis, transform faults (orange ellipsoids) and non-transform faults (purple ellipsoids). Measurements of lateral deviation (LD) correspond to the length of the arrows. For comparison, white squares represent the size of closeup shows in Fig 2. Credit: Aurore Sibrant. We can quantify the ridge shape by measuring the total lateral deviation, which is the total accumulated offset of the axis, when the tortuosity amplitude becomes stable. For cases with similar salinities, the results indicate two trends. First, the lateral deviation is high at slow spreading ridges and decreases within increasing spreading rate until reaching a minimum lateral deviation value for a given critical spreading rate (Fig 4A). Then the lateral deviation remains constant despite the increasing spreading rate. Experiments with different salinities also present a transition between tortuous and linear ridges. These two trends reflect how the lithosphere deforms and fails. In the first regime, the axial lithosphere is thick and is predominantly elastic-brittle. In such cases, the plate failures occur from the surface downwards through the development of faults: it is a fault-dominated regime. In contrast, for faster spreading rate or smaller salinities, the axial lithosphere is thin and is predominantly plastic. Laboratory inspection indicates that fractures in plastic material develop from the base of the lithosphere upwards: it is a fluid-intrusion dominated regime. In order to have a complete understanding of the mid-oceanic ridge system, it is essential to compare the laboratory results with natural examples. Hence, we measure the lateral deviation of nature oceanic ridges along the Atlantic, Pacific and Indian ridges. The measurements reveal the same two regimes as found in laboratory data. The remaining step consists of finding the appropriate scaling laws to superpose the natural and experiment data. This exercise requires dynamics similarity between analogue model and real-world phenomena which is demonstrated using dimensionless numbers (Sibrant et al., 2018). Particularly, the “axial failure parameter – πF” describes the predominant mechanical behaviour of the lithosphere relative to its thickness. Low-πF accretion is dominated by fractures in a predominantly elastic-brittle lithosphere: the lateral deviation of the ridges is tortuous, while at higher pF, accretion is dominated by intrusion in a predominantly plastic lithosphere: the shape of the mid oceanic ridges is mostly linear (Fig 4B). Figure 4. (A) Lateral deviation values measured in the experiments in function of the spreading rate velocities and salinities. (B) Evolution of the lateral deviation of the ridge axis, normalized by the critical axial thickness (Zc) relative to the axial failure parameter. Dark grey is the laboratory experiments and the colored circles are the Earth data. Adapted from Sibrant et al., 2018. 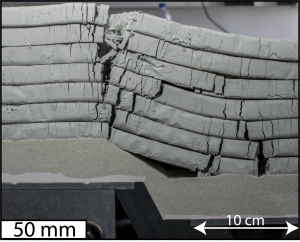 Our experiments give insight into the role of axial failure mode (fault-dominated or intrusion-dominated) on the shape of mid-oceanic ridges. 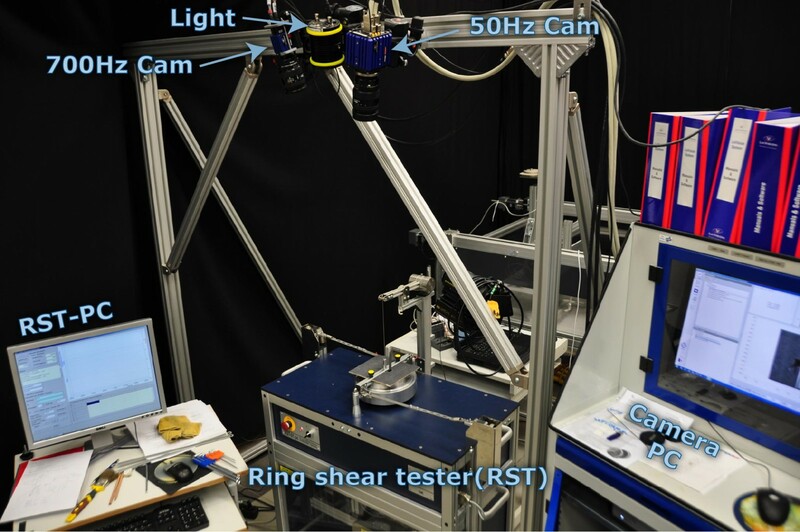 In the future, we want to use this experimental approach to investigate the origin of mechanical instabilities, such as transform faults or overlapping spreading centres. 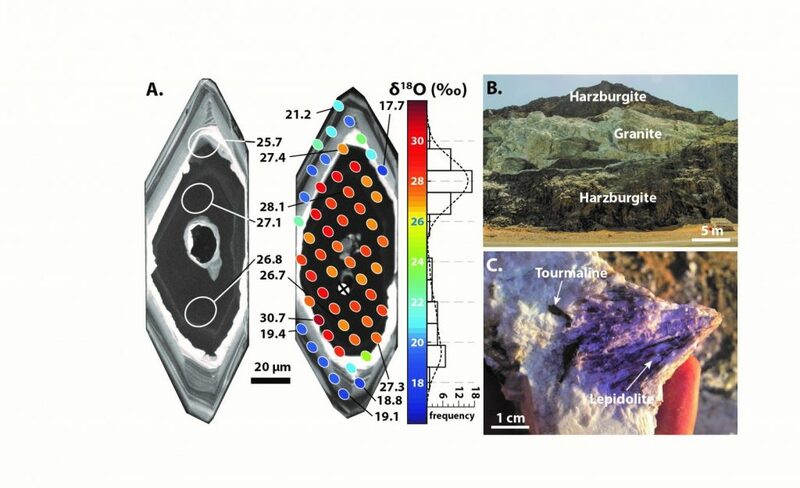 This experimental development and results are a collaborative work between Laboratoire FAST at Université Paris-Saclay and Department of Geological Sciences at the University of Idaho and involves E. Mittelstaedt, A. Davaille, L. Pauchard, A. Aubertin, L. Auffray and R. Pidoux. Buck, W.R., Lavier, L.L., Poliakov, A.N.B., 2005. Modes of faulting at mid-ocean ridges. Nature 434, 719-723. Schouten, H., Klitgord, K.D., Whitehead, J.A., 1985. Segmentation of mid-ocean ridges. Nature 317, 225-229. Carbotte, S.M., Macdonald, K. C., 1994. 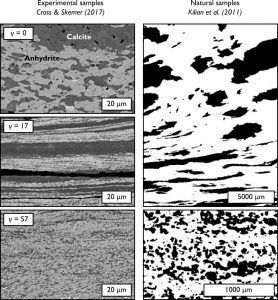 Comparison of seafloor tectonic fabric at intermediate, fast, and super fast spreading ridges: Influence of spreading rate, plate motions, and ridge segmentation on fault patterns. J. Geophys. Res. 99, 13609-13631. Phipps Morgan, J., Chen, J., 1993. Dependence of ridge-axis morphology on magma supply and spreading rate. Nature 364, 706-708. Oldenburg, D.W., Brune, J.N., 1975. An explanation for the orthogonality of ocean ridges and transform faults. J. Geophys. Res. 80, 2575-2585. Dauteuil, O., Bourgeois, O., Mauduit, T., 2002. Lithosphere strength controls oceanic transform zone structure: insights from analogue models. Geophys. J. Int. 150, 706-714. Püthe, C., Gerya, T., 2014. Dependence of mid-ocean ridge morphology on spreading rate in numerical 3-D models. Gondwana Res. 25, 270-283. Turcotte, D., Schubert, G., Geodynamics (Cambridge Univ. Press, New York, 1982). Di Giuseppe, E., Davaille, A., Mittelstaedt, E., Francois, M., 2012. Rheological and mechanical properties of silica colloids: from Newtonian liquid to brittle behavior. Rheologica Acta 51, 451-465. Sibrant, A.L.R., Pauchard, L., 2016. Effect of the particle interactions on the structuration and mechanical strength of particulate materials. European Physics Lett., 116, 4, 10.1209/0295-5075/116/49002. Sibrant, A.L.R., Mittelstaedt, E., Davaille, A., Pauchard, L., Aubertin, A., Auffray, L., Pidoux, R., 2018. Accretion mode of oceanic ridges governed by axial mechanical strength. 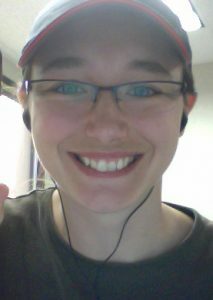 Nature Geoscience 11, 274-279. 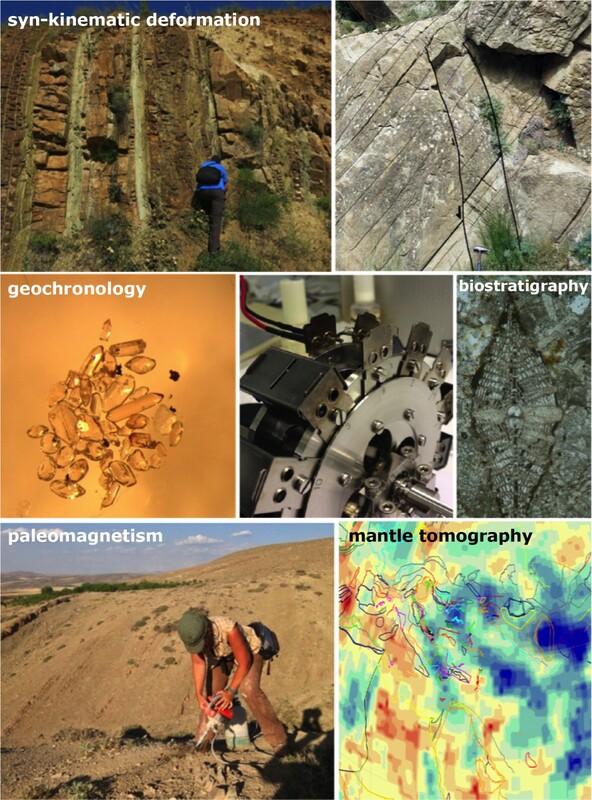 This edition of Minds over Methods article is written by Sarah Kachovich and discusses how tiny fossils can be used to address large scale tectonic questions. 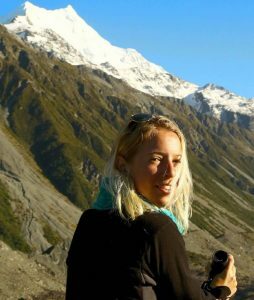 During her PhD at the University of Brisbane, Australia, she used radiolarian biostratigraphy to provide temporal constraints on the tectonic evolution of the Himalayan region – onshore and offshore on board IODP Expedition 362. Sarah explains why microfossils are so useful and how their assemblages can be used to understand the history of the Himalayas. And how are new technologies improving our understanding of microfossils, thus advancing them as a dating method? 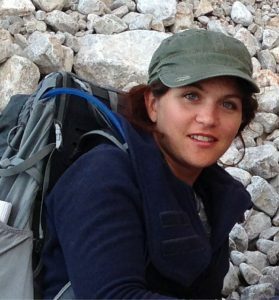 Sarah Kachovich, Postdoctoral Researcher at the School of Earth and Environmental Sciences, The University of Queensland, Australia. Radiolarians are single-celled marine organisms that have the ability to fix intricate, siliceous skeletons. This group of organism have captured the attention of artist and geologist alike due to their skeletal diversity and complexity that can be observed in rocks from the Cambrian to the present. As a virtue of their silica skeletons, small size and abundance, radiolarian skeletons can potentially exist in most fine-grained marine deposits as long as their preservation is good. This includes mudstones, hard shales, limestones and cherts. To recover radiolarians from a rock, acid digestion is commonly required. For cherts, 12-24 hours in 5 % hydrofluoric acid is needed to liberate radiolarians. Specimens are collected on a 63 µm sieve and prepared for transmitted light or scanning electron microscope analysis. 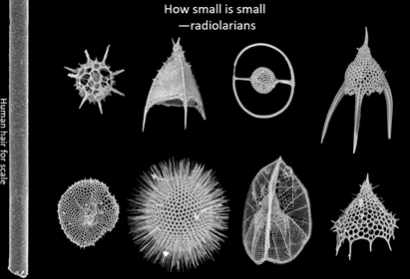 Scale and diversity of modern radiolarians. Credit: Sarah Kachovich (radiolarians from IODP Expedition 362) and Adrianna Rajkumar (hair). The radiolarian form has changed drastically through time and by figuratively “standing on the shoulders of giants”, we correlate forms from well-studied sections to determine an age of an unknown sample. A large effort of my PhD was aimed to progress, previously stagnant, research in radiolarian evolution and systematics in an effort to improve the biostratigraphical potential of spherical radiolarians, especially from the Early Palaeozoic. 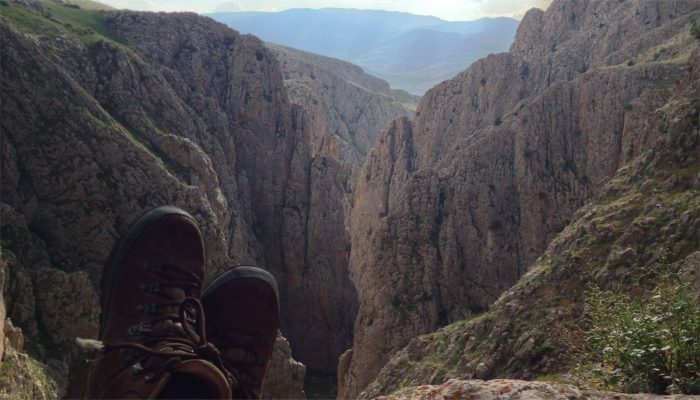 The end goal of this work is to improve the biostratigraphy method and its utility, thus increasing our understanding of the mountain building processes. The main problem with older deposits is the typical states of preservation, where radiolarians partly or totally lose their transparency, which makes traditional illustration with simple transmitted light optics difficult. Micro-computed tomography (µ-CT) has been adopted in fields as diverse as the mineralogical, biological, biophysical and anatomical sciences. Although the implementation in palaeontology has been steady, µ-CT has not displaced more traditional imaging methods, despite its often superior performance. To study small complex radiolarian skeletons, you need to mount a single specimen and scan it at the highest resolution of the µ-CT. The µ-CT method is much like a CAT scan in a hospital, where X-rays are imaged at different orientations, then digitally stitched together to reconstruct a 3D model. The vital function of the internal structures provides new insights to early radiolarian morphologies and is a step towards creating a more robust biostratigraphy for radiolarians in the Early Paleozoic. Radiolarian chert is important to Himalayan geologists as it provides a robust tool to better document and interpret the age and consumption of oceanic lithosphere that once intervened India and Asia before their collision.The chert that directly overlies pillow basalt in the ophiolite sequence (remnant oceanic lithosphere) represents the minimum age constraint of its formation. In the Himalayas, over 2000 km of ocean has been consumed as India rifted from Western Australia and migrated north to collide with Asia. Only small slivers of ophiolite and overlying radiolarian cherts are preserved in the suture zone and it is our job to determine how these few ophiolite puzzle pieces fit together. Another way I have been able to link microfossils to Himalayan tectonics is by studying the history and source of erosion from the Himalayas on board IODP Expedition 362. 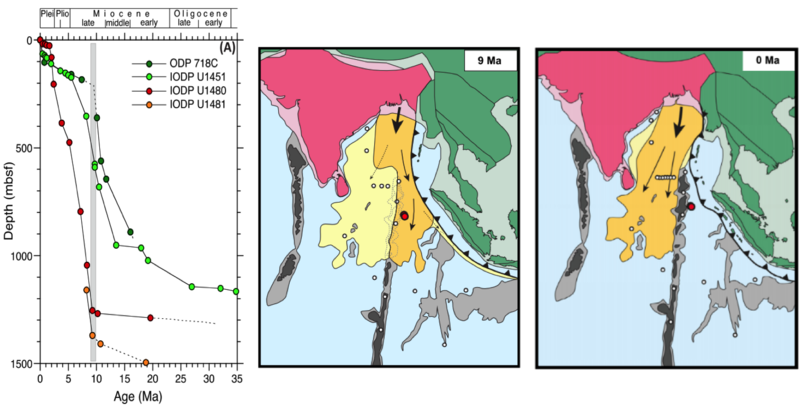 Sedimentation rates obtained from deep sea drilling can provide ages of various tectonic events related to the India-Asia collision. For example, we were able to date various events such as the collision of the Ninety East Ridge with the Sumatra subduction zone, which chocked off the sediment supply to the Nicobar basin around 2 Ma as the ridge collided with the subduction zone. Left: Results from the McNeill et al. (2017) of the sedimentation history of Bengal Fan (green dots) and Nicobar Fan (red dots). Middle/right: Reconstruction of India and Asia for the past 9 million years showing the sediment source from the Himalayas to both basins on either side of the Ninety East Ridge. Lastly, on board Expedition 362 we were able to use microfossils to understand how and why big earthquakes happen. 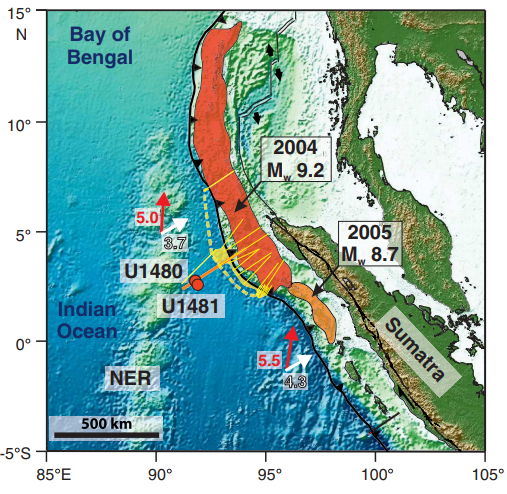 We targeted the incoming sediments to the Sumatra subduction zone that were partly responsible for the globally 3rd largest recorded earthquake (Mw≈9.2). This earthquake occurred in 2004 and produced a tsunami that killed more than 250,000 people. From the seismic profiles (see example below), we found that the seismic horizon where the pre-decollement formed coincided with a thick layer of biogenetically rich sediment (e.g. radiolarians, sponge spicules, etc.) found whilst drilling. Under the weight of the overlying Nicobar Fan sediments, this critical layer of biogenic silica is undergoing diagenesis and fresh water is being chemically released into the sediments. The fresh water within these sediments is moving into the subduction zone where it has implications to the physical properties of the sediment and the morphology of the forearc region. The Sumatra subduction zone. The dark orange zone represents the rupture area of the 2004 earthquake. Also shown are the drill sites of IODP Expedition 362 and the location of seismic lines across the plate boundary. Seismic profile: The fault that develops between the two tectonic plates (the plate boundary fault) forms at the red dotted line. Note the location of the drill site. For our next Minds over Methods, we go back into the laboratory, this time for modelling seismotectonics! 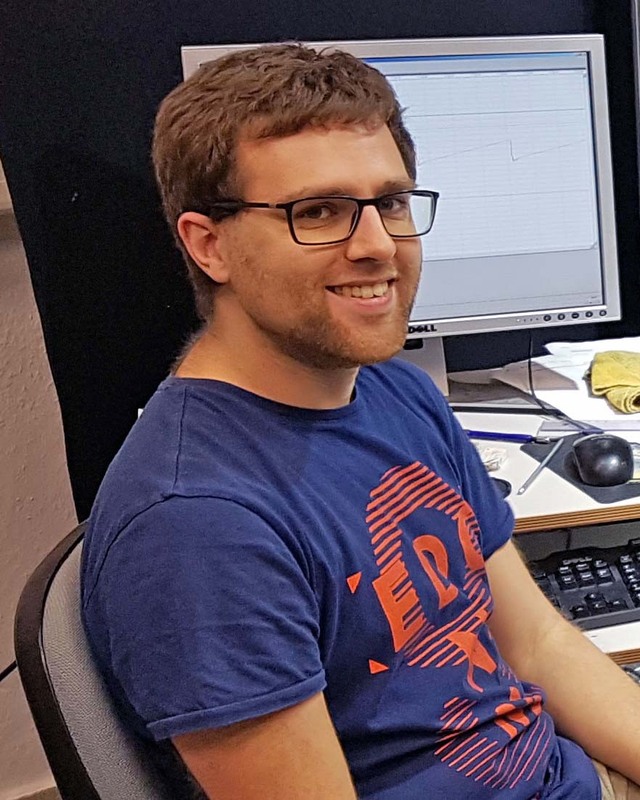 Michael Rudolf, PhD student at GFZ in Potsdam (Germany), tells us about the different types of analogue models they perform, and how these models contribute to a better understanding of earthquakes along plate boundaries. 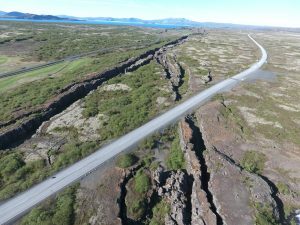 The recurrence time of large earthquakes that happen along lithospheric-scale fault zones such as the San Andreas Fault or Chile subduction megathrusts, is very long (≫100 yrs.) compared to human timescales. The scarcity of such events over the instrumental record of around 60 years is unfortunate for a statistically sound analysis of the earthquake time series. So far, only few megathrust events have been monitored in detail with near-field seismic and geodetic networks. To circumvent this lack of observational data, we at Helmholtz Tectonic Laboratory use analogue modelling to understand plate boundary faulting on multiple time-scales and the implications for seismic hazard. 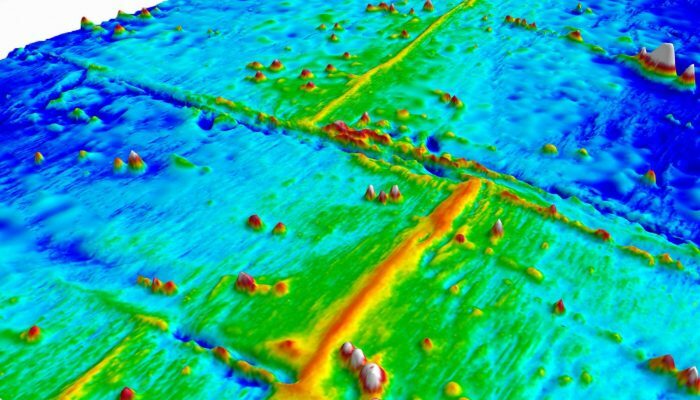 We use models of strike-slip zones and subduction zones, to investigate several aspects of the seismic cycle. Additionally, numerical simulations accompany and complement each experimental setup using experimental parameters. 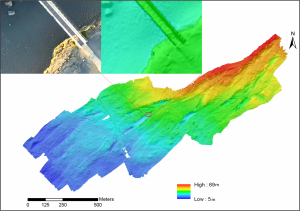 In my project, we develop experiments that can model multiple seismic cycles in strike-slip conditions. Our study employs two types of experimental setups both are using the same materials. The first is simpler (ring shear setup) and is able to show the on-fault rupture propagation. The second is geometrically more similar to the natural system, but only the surface deformation is observable. 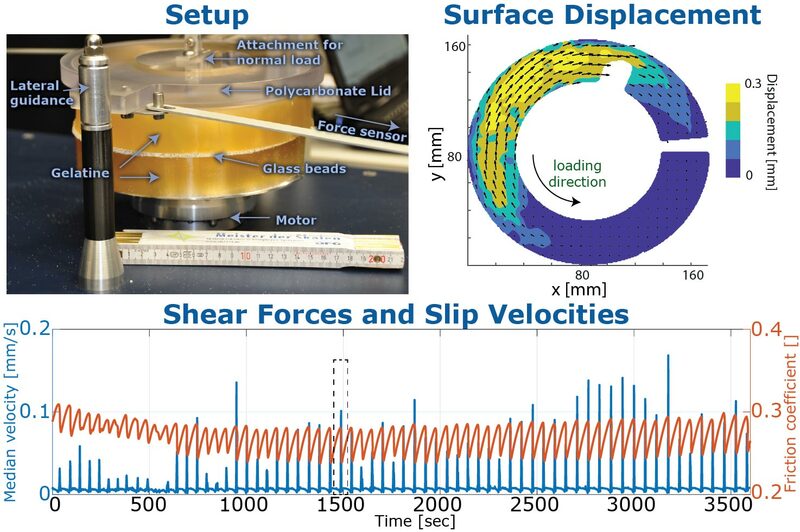 To model rupture propagation, we introduce deformable sliders in a ring shear apparatus. Two cylindrical shells of ballistic gelatine (Ø20 cm), representing the side walls, rotate against each other, with a thin layer (5 mm) of glass beads (Ø355-400µm) in between representing an annular fault zone. A see-through lid connected to force sensors holds the upper shell in place, whereas the machine rotates the lower shell. Through the transparent lid and upper shell, we directly observe the fault slip. We can vary the normal stress on the fault (<20 kPa) and the loading velocity (0.0005 – 0.5 mm/s). The next stage of analogue model, features depth-dependent normal stress and a rheological layering mimicking the strike-slip setting in the uppermost 25-30 km of the lithosphere (see also Mehmet Köküm’s blog post). A gelatine block (30x30cm) compressed in uniaxial setting represents the elastic upper crust under far-field forcing. Embedded in the block is a thin fault filled with quartz glass beads. The ductile lower crust is modelled using viscoelastic silicone oil. The model floats in a tank of dense sugar solution, to guarantee free-slip, stress-free boundaries. Both setups generate regular stick-slip cycles including minor creep. Long phases of quiescence, where no slip or very slow creep occurs, alternate with fast slip events sometimes preceded by slow slip events. The moment magnitude of analogue earthquake events is Mw -7 to -5. The cyclic recurrence of slip events is an analogue for the natural seismic cycle of a single-fault system. Optical cameras record the slip on the fault and the deformation of the sidewalls. Using digital image correlation techniques, we are able to visualize accurately deformations on the micrometre scale at high spatial and temporal resolution. Accordingly, we can verify that analogue earthquakes behave kinematically very similar to natural earthquakes. They generally nucleate where shear stress is highest, and then propagate radially until the seismogenic width is saturated. In the end, the rupture continues laterally along the fault strike. Our experiments give insight into the role of viscoelastic relaxation, interseismic creep, and slip transients on the recurrence of earthquakes, as well as the control of loading conditions on seismic coupling and rupture dynamics. 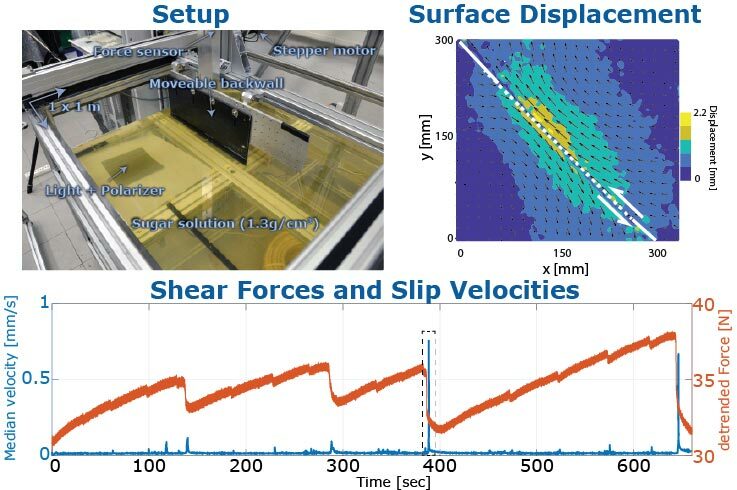 Together with our partners in the Collaborative Research Centre (CRC1114 – Scaling Cascades in Complex Systems) we employ a new mathematical and numerical description of the fault system, to simulate our experiments and get a physical understanding of the empirical friction laws. In the future, we want to use this multiscale spatial and temporal approach to model complex fault networks over many seismic cycles. The experiments serve as benchmarks and cross-validation for the numerical code, which in the future will be using natural parameters to get a better geological and mathematical understanding of earthquake slip phenomena and occurrence patterns in multiscale fault networks. How can we use GPS velocities to learn more about present-day plate motions and regional deformation? In this edition of Minds over Methods, one of our own blogmasters Mehmet Köküm shares his former work with you! 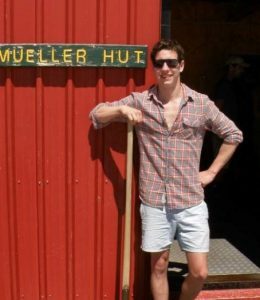 For his master thesis at Indiana University, he used block modeling to better understand the plate motion and slip rates of Anatolia and surrounding plates. 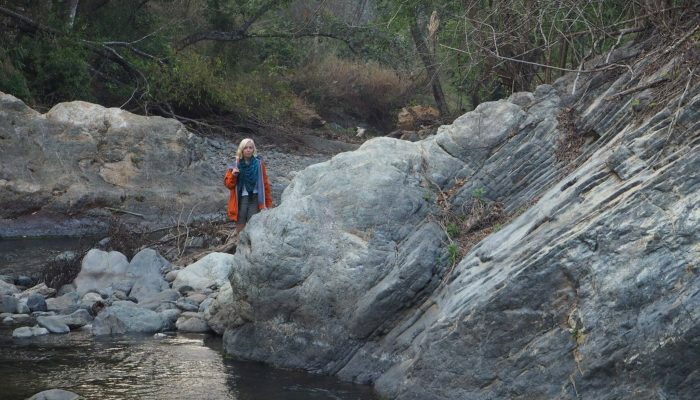 Until the late 1980’s, geological features such as offset of geomorphological markers were mainly used to determine historical slip rates along faults. Since the mid 1990’s, however, GPS has been widely used since it gives more accurate estimates of present-day slip rates by calculating strain accumulation at the crust. 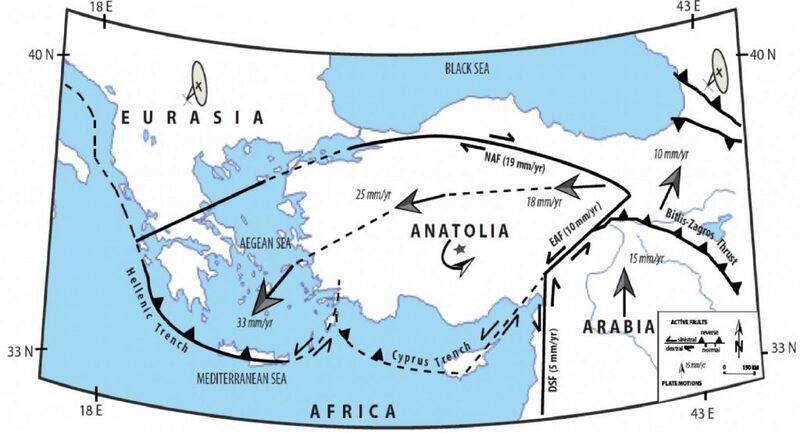 In this work, I use a GPS derived velocity field of Anatolia including data from 1988 to 2005 by Reilinger et al. (2006). Turkey (Anatolian Plate) is located in the center of the Alpine fold and thrust belt. 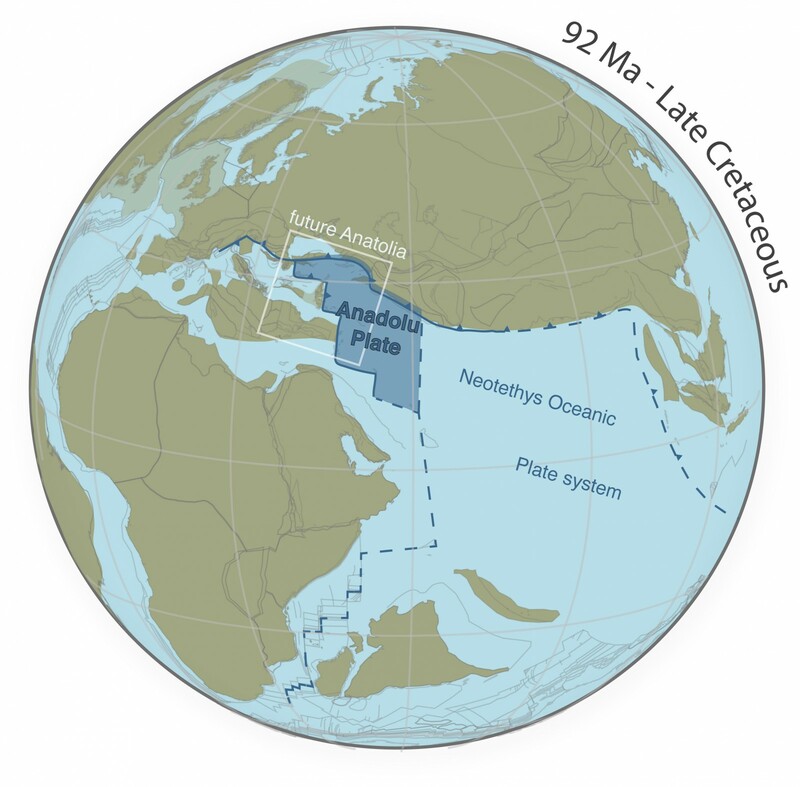 Due to the closure of different branches of the Neo-Tethys Ocean, main tectonic features of the Anatolian Plate are complicated by interactions between several tectonic plates. 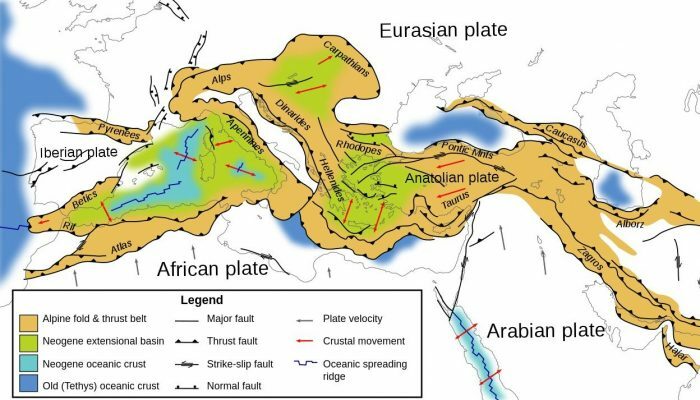 The Arabian plate collides with the African plate in the south and the Eurasian plate in the north while the African plate subducts beneath the Anatolian plate along the Hellenic-Cyprus trench. As a result of these complex tectonic structures, the Anatolian plate displays various tectonic styles simultaneously. Kinematic block modeling of interseismic surface motions has been used in different formats by several authors (e.g., McClusky et al. 2000; Westaway 2000; Barka and Reilingier 1997, 2006). The block modeling approach used here is described by Johnson and Fukuda (2010). In this study we used an elastic block model, which is a traditional block model that assumes no long-term deformation of the blocks. For simplicity, all faults are vertical, plates are considered as blocks and are assumed to be rigid. Block boundaries are defined from historic earthquakes, mapped faults and seismicity. Many of the major structures in Anatolia are well known except for a few submarine structures. Locking depths indicate the depth for which a fault is completely locked above and creeping below. Estimates of these locking depths are output of the modeling studies and should correlate with the depth of major earthquakes along related faults. Meade and Hager (2005) suggest that there is a relation between locking depth and fault slip rates. Shallower locking depths correlate with slower slip rate estimates; therefore, GPS velocities near locked faults have slower velocities (Reilinger et al., 2006). On the basis of the GPS velocity field, the Anatolia and Aegean blocks show counterclockwise motion with respect to the Eurasian plate and the rate of the motion increases towards the west. The locking depth variations of the work are between 20-25 km, which correlates with the focal depths of significant earthquakes. The major fault slip rates are consistent with some of the geological slip rate estimates. What is the influence of salt tectonics on the evolution of sedimentary basins and how can we reconstruct such salt features? 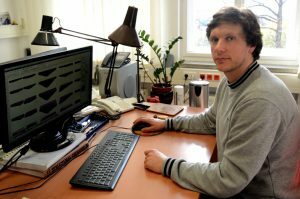 Michael Warsitzka, PhD student at the Friedrich Schiller University of Jena, explains which complementary methods he uses to better understand salt structures and their relation to sedimentary basins. Enjoy! Salt tectonics, as a sub-discipline of structural geology, describe deformation structures developing due to the special deformation behaviour of salt (as synonym for a sequence of evaporitic rocks). 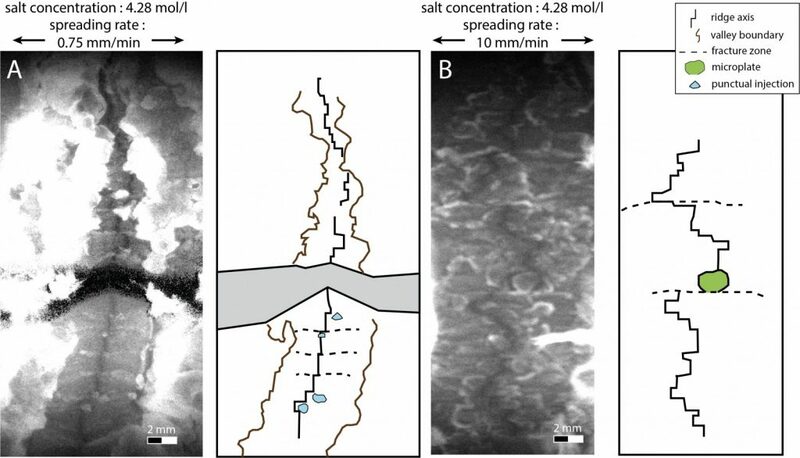 Salt behaves like a viscous fluid over geological time scales and, therefore, it may flow due to lateral differences in thickness and density of the supra-salt layers. This influences the structural evolution of sedimentary basins, because salt flow can modify the amount of regional subsidence of the basin. Local sinks (“minibasins”) develop in regions from where salt is squeezed out and salt structure uplifts, e.g. diapirs or pillows evolve in regions of salt influx. 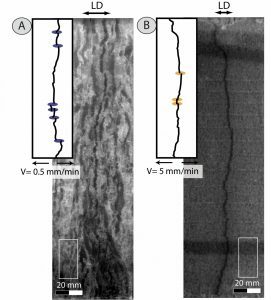 Unfortunately, temporal changes of salt flow patterns are often difficult to reconstruct owing to enigmatic ductile deformation structures in salt layers. Understanding the evolution of salt-related structures requires either forward modelling techniques (e.g. physically scaled sandbox experiments) or restoration of sedimentary and tectonic structures of the supra-salt strata. 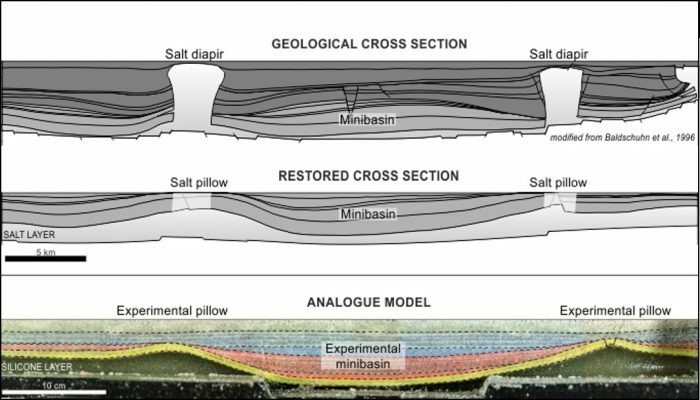 In my PhD thesis, I tried to integrate both, analogue modelling and restoration, to investigate salt structures and related minibasins developed in the realm of extensional basins. The sandbox model is a lab-scale, simplified representative of natural salt-bearing grabens, e.g. the Glückstadt Graben located in the North German Basin (Fig. 1). A viscous silicone putty and dry, granular sand were used to simulate ductile salt and brittle overburden sediments. Cross sections were cut through the model at the end of each experiment to conduct reconstruction of the final experimental structures. The material movements were monitored with a particle tracking velocimetry (PIV) technique at the sidewalls of the experimental box. Using experimental and geological cross sections, structures in the overburden of the ductile layer can be reconstructed, if present-day layer geometries and lithologies of the overburden strata can be identified. From natural clastic and carbonatic sediments we know that they compact with burial, reducing the layer thickness. Therefore, the reconstruction procedure sequentially removes the uppermost layer and layers beneath are decompacted and shifted upwards to a horizontal surface (Fig. 2). The sequence of decompaction and upward shifting is then repeated until the earliest, post-salt stage is reached (Fig. 1). It intends to restore the initial position, shape and thickness of each reconstructed layer. In analogue experiments, no decompaction is necessary, because the compressibility of the granular material is insignificant for depths of a few centimetre. Restoration can be directly applied to coloured granular layers revealing detailed layer geometries for each experimental period (Fig. 2a). 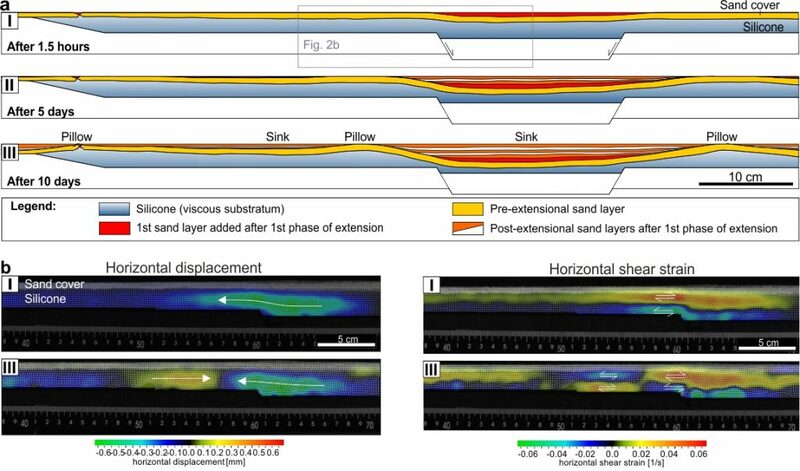 The PIV technique displays coeval material movement and strain patterns occurring during the subsidence of the experimental minibasins (Fig. 2b). Based on the observation that the experimental structures resemble those reconstructed from the natural example (Glückstadt Graben during the Early Triassic, Fig. 1), it can be inferred that strain patterns observed in the experiments took place in a similar manner during the early stage of extensional basins. This demonstrates the advantage of applying both methods. First, original geometries of basin structures can be determined from the restoration and then reproduced in the model. If the restored geometries are suitably validated by the models, the kinematics observed in the model can be translated back to nature and help to understand the effect of salt flow on the regional subsidence pattern.